I thought this sign was very appropriate for today. My husband, Kirk and I are celebrating our 32nd anniversary. Our journey together as a couple and as a family has been one filled with great joy. I look back to where 'we' began and remember how lucky I was to have met Kirk. It has been greater than I ever could have imagined. 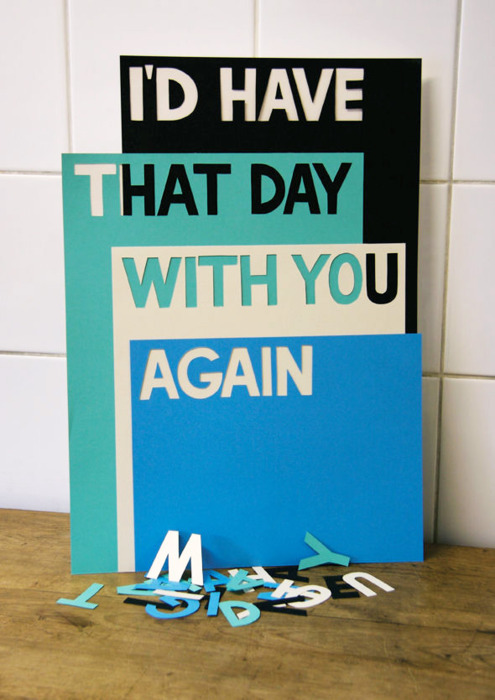 Today, of all days, I want to tell him that he is still the one I would choose to give my heart to. The pictures below are from two very special wedding days. The first one is of my attendants on my wedding day. The next one is from my daughter's wedding day. I was very fortunate that they were able to be in attendance at her wedding and I had the photographer take a picture of us with my daughter, Kirsten. 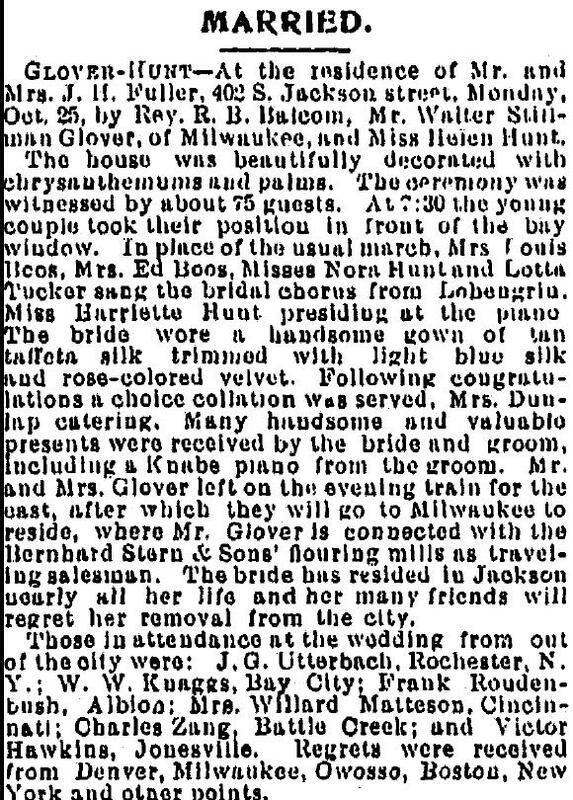 While trying to identify the parentage of my third great grandmother, Vinera Powers Glover, I decided to research the family of her sister, Mary Ann Powers, who married Charles Williamson Glover. Charles Williamson Glover is the brother of Vinera Powers husband, Samuel Stillman Glover. This research led me to Charles and Mary Ann Glover's son, Henry P. Strong Glover. Henry P. Strong Glover is a fascinating research subject, whom I look forward to writing more about. 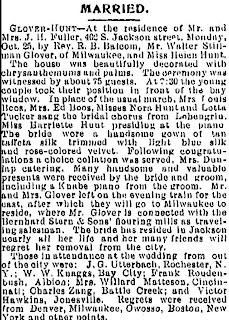 One of the reasons he is fascinating to research is because of the numerous records found for Henry P. Strong Glover. He was born in 1837 and died in 1912. Henry P. Strong Glover became quite the citizen of Ypsilanti, Michigan during his 74 years of life. He served as Mayor of Ypsilanti, President of a few companies, and Vice President of Ypsilanti Savings Bank becoming wealthy in his endeavors. One of the benefactors of this wealth was the University of Michigan. Henry P. Glover donated the DeCriscio Collection of Latin inscriptions. Henry P. Strong Glover donated a collection consisting of over 250 inscriptions on marble, brick, lead pipe, etc. The earliest piece is from the time of Augustus in the fifth century. Henry donated this collection to the University of Michigan in 1899. Source: "Latin Inscriptions. 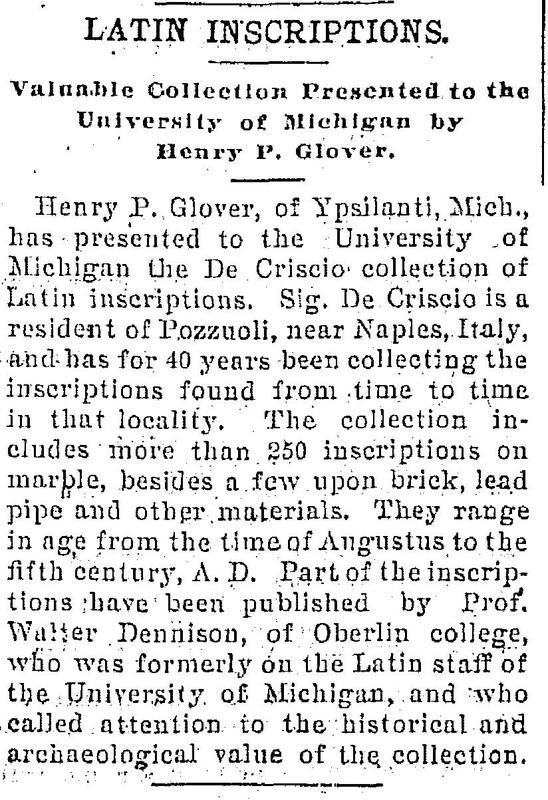 Valuable Collection Presented to the University of Michigan," Jackson Citizen Patriot (Jackson, Michigan), 1 December 1899, citing the donation of Latin Inscriptions to the University of Michigan; online images, Genealogy Bank (www.genealogybank.com : accessed 9 March 2013), Historical Newspapers. Valuable Collection Presented to the University of Michigan by Henry P. Glover. 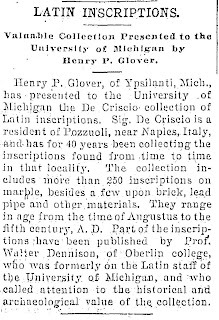 Henry P. Glover, of Ypsilanti, Mich., has presented to the University of Michigan the De Criscio collection of Latin inscriptions. Sig. De Criscio is a resident of Pozzuoli, near Naples, Italy, and has for 40 years been collecting the inscriptions found from time to time in that locality. The collection includes more than 250 inscriptions on marble, besides a few upon brick, lead pipe and other materials. They range in age from the time of Augustus to the fifth century A. D. Part of the inscriptions have been published by Prof. Walter Dennison, of Oberlin college, who was formerly on the Latin staff of the University of Michigan, and who called attention to the historical and archaeological value of the collection. I had done it! I successfully completed my semester of student teaching and I was so close to graduation I couldn't believe it. I just had to finish six more credit hours at Western Michigan University in Kalamazoo, Michigan. I needed to decide where I was going to live while completing my coursework. I was contemplating a move back to Kalamazoo when the guy I was dating suggested moving to his hometown, Coloma, Michigan, which is 40 miles from Kalamazoo. I checked into the course schedule and realized I could take my classes on Tuesday and Thursday. So, I decided to commute and found myself living in Coloma in 1979. Coloma is a small city in the area known as the Fruit Belt of Michigan. Orchards of cherries, apples, peaches and more can be found in the fertile farmlands of southwest Michigan. Summertime brings activities at Paw Paw Lake. My boyfriend owned a boat and we would go out on the lake, he would water ski and I would soak up the sun while someone else drove. Winter is a time for snowmobiling, which I did and actually enjoyed riding with others on trails to a number of small towns in the area. 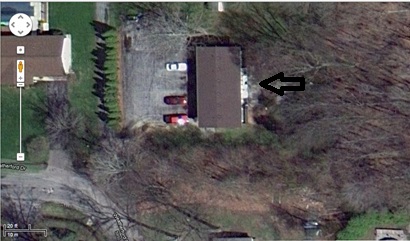 I rented an apartment on Wetherford Terrace in Coloma. It was a one bedroom, one bath, living room, kitchen and dining area place. 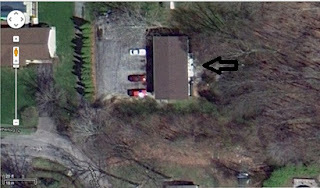 I lived on the ground level with sliding doors to a small patio that overlooked a wooded area. It was the first place I could call my own. I felt so grown up. My boyfriend still lived with his parents (that should have been a clue of what was to come) which was outside of Coloma. I decided to substitute teach until school was out for the summer and was able to get quite a few jobs in the nearby town of Watervliet. I loved teaching at Watervliet. I substitute taught in the Junior and Senior High School. The students were wonderful and the staff made me feel welcome. On one of the first days I taught I ran into a teacher from my high school, Miss Pizer. It sounds like it was a marvelous experience and for the most part it was. I commuted to Western to finish my degree and worked as a substitute teacher. It was during this time that I started having leg cramps, I contributed it to the tennis class I was taking. Then I got sick and I couldn't shake it. Looking back on it I believe this was the start of my thyroid problems, but the doctor couldn't find anything wrong with me. I trudged on and eventually graduated from Western in August of 1979. I spent the summer applying for a full time teaching job and working a part time job at a local diner. September came without a job offer so I went back to substitute teaching. I had a couple of long term sub positions and was able to pay my bills. My health was better, but not great. I was gaining weight and couldn't figure out why. September also brought a marriage proposal. I thought I was in love and immediately said yes. We set a wedding date for October of the following year. I started making wedding plans. It wasn't until December of 1979 that things started falling apart. I went home for Christmas and my boyfriend wasn't happy that I didn't spend Christmas with his family. I came back to Coloma after Christmas and brought my younger brother and sister back with me. My boyfriend and I had made plans to take them snowmobiling and spend lots of time having fun with them. I get back to my apartment and my boyfriend stops by and asks if he can talk to me in the bedroom. He broke up with me right then. I was devastated, but also ticked off that he did it in front of my sister and brother. Needless to say it was a crappy getaway for them. I drove my sister and brother home and made plans to return to Coloma and substitute teach until I found a full time teaching position. My dad would call and try to convince me to move home and substitute teach. He said I could live at home rent free and wouldn't have the expenses I had living in Coloma. I didn't want to move home, I thought that would make me a failure. Eventually, his persuasion won me over and I moved back home. It was the best decision I ever made for a couple of reasons. One, the first day I substitute taught I met a fifth grade teacher that I would eventually date, fall in love with, marry and have children with, Kirk. And two, I found a doctor who diagnosed me with thyroid cancer. Moving home allowed me to stay on my parents' medical insurance, thankfully. I learned a lot while living in Coloma and the experiences I had there shaped me as a person. But, the move from there brought me more joy than I ever thought imaginable. My paternal, third great-grandfather, William G. Dyer, was born 8 February 1814. 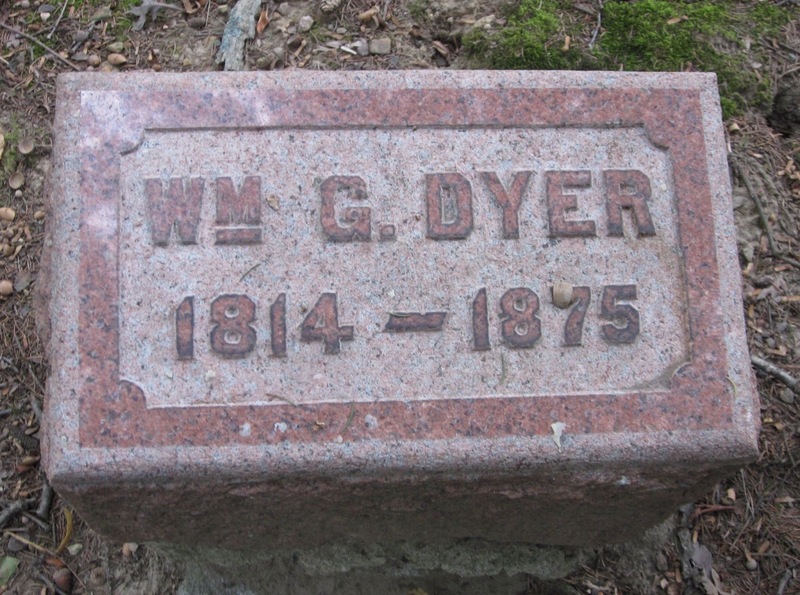 He married Mary Ann Swallow and had five children: Adaline L, George, Sarah, Mary, and William B.
William G. Dyer died 8 May 1875 in Adrian, Lenawee, Michigan and is buried in Oakwood Cemetery, Adrian, Lenawee, Michigan in Plot B23-38. 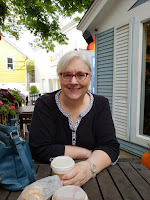 Jim Sanders at Hidden Genealogy Nuggets website and blog has created the Genealogy by the States blogging prompt, suggesting that bloggers write about an ancestor or one of our families that have a connection to that state. Each week a different state is featured. This week's state is New Hampshire. The shifting state boundaries has made researching New Hampshire an interesting challenge. The boundary between Massachusetts and New Hampshire wasn't defined until 1741. New Hampshire gave land grants to land that was claimed by New York and that land eventually became Vermont. Present day boundaries were defined in the mid 1700's. 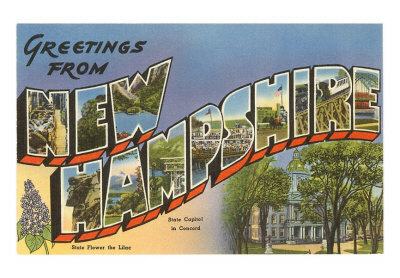 New Hampshire became a state in 1788. My New Hampshire ancestry is from the Poor-Santclare line of my family. The earliest record I found for my New Hampshire ancestry was in 1767. Family Search has the New Hampshire, Marriage Records 1637-1947 online and a record of Moses Poor and Hannah Santclare (indexed as Santetar) marriage was found on 31 March 1767 in Hampstead, Rockingham, New Hampshire. Moses Poor served New Hampshire as a Private in Captain Elisha Woodbury's Company and Colonel Jno Stark's Regiment in the American Revolution. He was killed at Bunker Hill in 1775. Service records can be found in the New Hampshire State Records (see link below). According to the New Hampshire Probate Records, Volume 38; pages 438-439, George Santclare (St. Clair) left a will dated, 10 April 1767. He lists his daughter, Hannah Poor, and son Moses Poor. The New Hampshire Probate Records includes the complete transcription of this and other wills. Family Search.org has New Hampshire, Birth Records, Early to 1900's, where I found my fourth great grandfather, Moses Augustus Poor, born 27 January 1768 in Atkinson, Rockingham, New Hampshire to Moses Poor and Hannah Santclar. 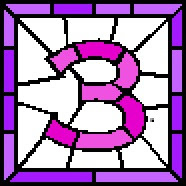 What is your favorite New Hampshire resource?